CMC Surface analysis November 25 18:00 UTC, November 26 00, 06 and 1200. With real cold air in Siberia, normal -45 C, but warmer every where else in the Arctic. Some North Atlantic Cyclones now repulsed towards and warming the Urals, this was the settled view for years starting in October. We now have a push block situation, the Pacific Cyclone is pushing Northwards, the latest North Atlantic Cyclone blocked and stalling towards Greenland. Unprecedented Arctic Ocean surface Air warming and computer modeling, are they integrating the sea ice current morphology? First the unprecedented warming bit. Autumn early winter 2016 outclasses all others. DMI North of 80 surface temperature s easily beat 1998, 2007 and 2012 by very wide margins. Fall 2011 DMI really didn't give a hint of the coming 2012 summer season melt. 2006 fared quite well, 2015 not so bad. ECMWF 500mb animation, next 7 days along with 2 other models, GFS and CMC , all agree that the incoming Cyclones from the North Atlantic will not happen. 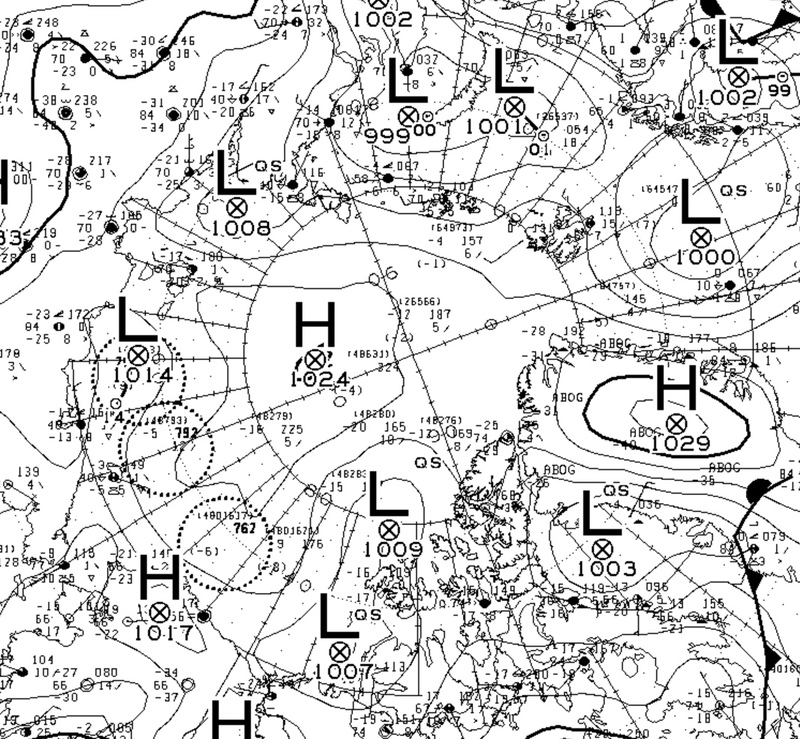 Note the lack of steady position of the 500 mb Lowest thickness. 500 mb is used here to find the coldest column of air about . 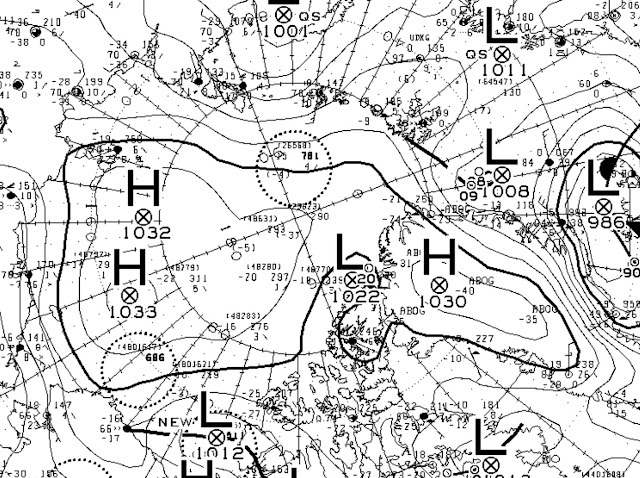 If the 500 mb lowest height was around Southern Greenland, there would be great flow Northwards. 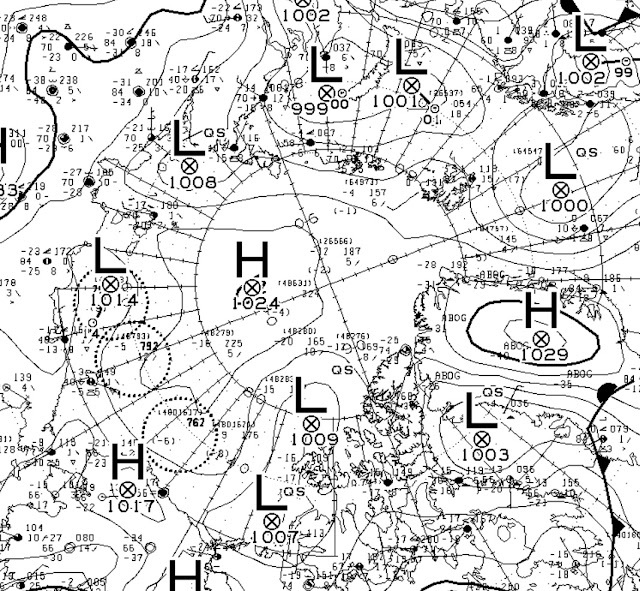 Arctic Ocean air in total darkness enormous warmth, even in clear skies with partial North Atlantic air advection. ~Only one thing does that: ocean heat. CMC Nov 21, 1800 UTC, Surface Analysis. Total darkness, varied in location -4 C to -20 C Arctic Ocean temperatures are extremely warm as a whole. In particular Buoy 48276 , -12 C 85 N 90 W, a place where -30 C is common at this time of the year. What we see there is a great number of leads, where once was the densest thickest sea ice, the engine that spurred winter to roar is now mainly cooled from the South, the only advection there is cold from land. 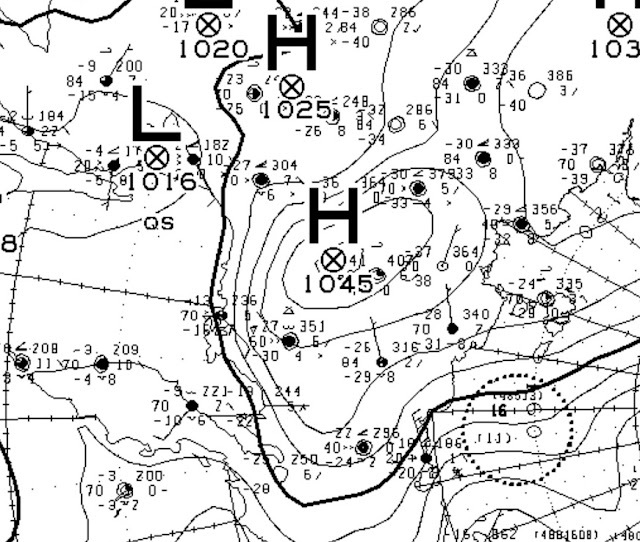 The 1024 mb High is not conducive to warming in darkness as well. The only thing left is the warming from thinner sea ice and these leads, which under clouds, or making clouds, keep the surface air on top of sea ice warm. 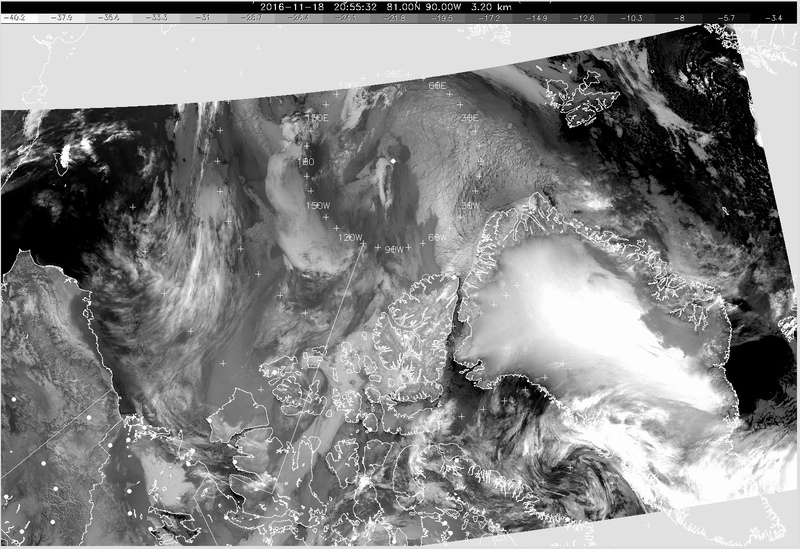 NOAA HRPT November 21 1500-2200 UTC IR animation. The warmest air as seen on surface analysis was below denser clouds, but the open air has absolutely no other heat source but from the Ocean. to get through the big lead wall, 1 kilometer a week speed. 2016 offers no such icescape. 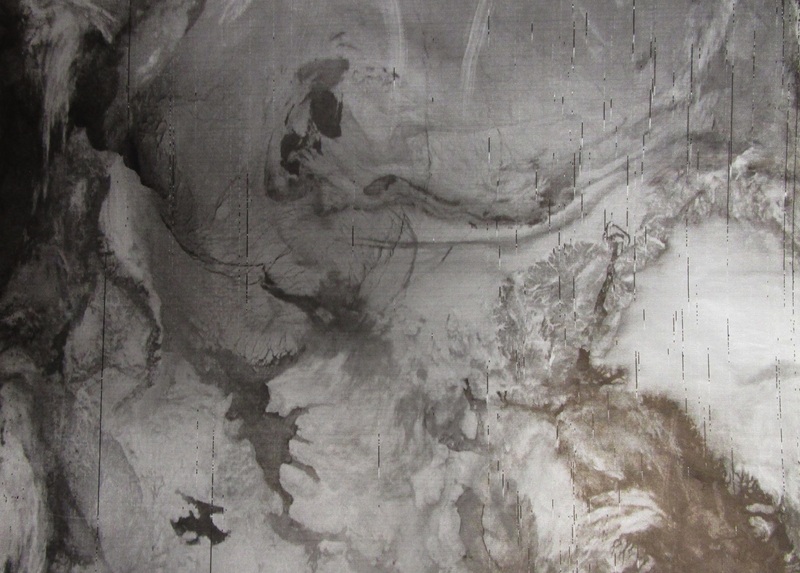 November 17 1988 IR NOAA capture, note sea ice temperature as white as the land features. Meaning , winter was normally huge, spread out From Russia to Canada. A completely different world of weather. 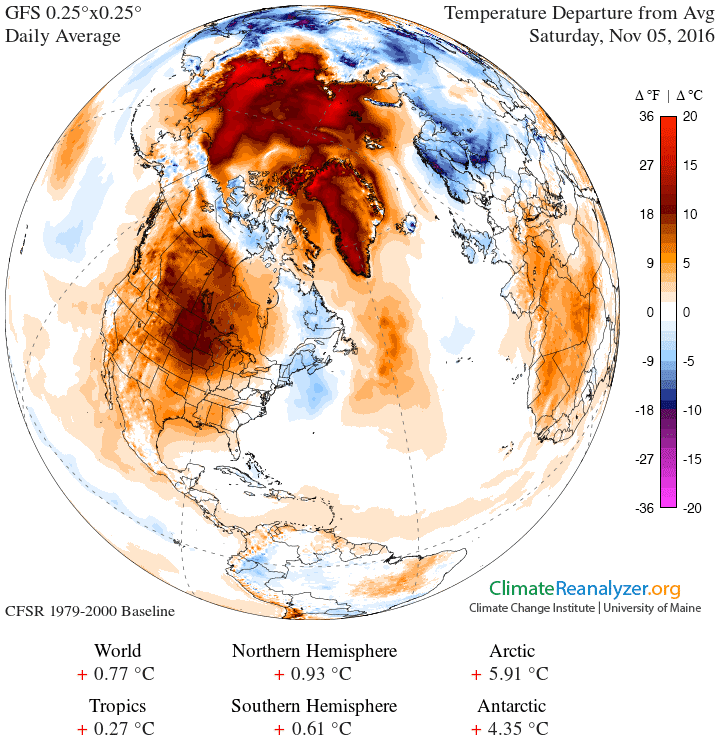 November 18, 2016, whatever is cold is over Ellesmere and Greenland, with very little sea ice freezing as much as 1988. Cyclones dominate the Arctic Ocean. Spitzbergen is surrounded by open water, the strait between Northern Ellesmere and Greenland has loose pack ice, no tidal ring forming. WD Novenber 19,2016.
densest sea ice should be, North of the Canadian Arctic Archipelago, 2016 warmest by 10 to 12 C.
It is an undeniable reflection of the state of sea ice, swamped by mainly Atlantic cyclones, which have dramatically slowed the refreeze, but a stronger presence of thicker sea ice with less leads do the opposite, repulse Cyclones. The year for Nov 14 with the lowest expansive Arctic Ocean Pressure was again by far 2016. ~ New equipment allows to capture horizon with sun as low as -11 degrees below A.H.
~Very latest data suggests 2016 has exceedingly thin sea ice. A series of observations on the ground and within the air itself may help explain surface based thermal inversions, of which a significant player is sea ice and snow cover. Darkness offers ideal thermal flux studies, largely because inconsistent rapid changes by clouds and sun radiation from varying elevations can change the thermal balance quickly. Without the sun, we can literally see how thick sea ice is because the only heat source is mostly from the Ocean even if covered by ice and snow insulation. If sea ice is thinner, more heat escapes from it by conduction, convection and IR rays. But the very top of sea ice surface can have the same temperature but was never observed warmer than surface air, triggering a prime optical refraction rule: - top of sea ice is always colder or equal in temperature to surface air- , as observed in all observation captures so far, this is just as so in darkness as well. It is also known that the upper air temperature profile maximum point increases in altitude in direct proportion to how cold the lower atmosphere is. The higher the warmest air layer altitude is on a given upper air profile, the lesser it can influence the surface temperature below, the steeper the surface based inversion usually becomes, in optical response the horizon rises. Warmer oceans than air right above always cause the surface to air interface to be adiabatic, freezing of sea ice surface marks the beginning of a different lower atmospheric profile, isothermal at first, then progressively after, surface based inversions start to dominate and eventually persist all winter except for advection from long night Cyclonic intrusions. November 11 2015 (darker image), had about 1 arc minute higher horizon elevation compared to 2016 November 15. As such, Nov 2016 had warmer temperature -20.3 than 2015 -24.5 C. Photo captures were done with older telescope (darker image) and more powerful newer telescope (brighter image). So far, all comparisons with previous years in brighter very early February captures suggest a very thin sea ice at present. WD (Nov 15,2016). ~The fight is on, but Darkness will make winter win. 18 z CMC Nov12 2016, the flow of warmed air over open water meets the coldest of this winter yet from Siberia. There has to be cooling in darkness, especially over land areas. And so it happened. In the not so distant past the Arctic Ocean the Arctic Ocean was solid frozen at this moment, winter easily spread Northwards making a much more fierce winter core for the rest of the Northern Hemisphere. 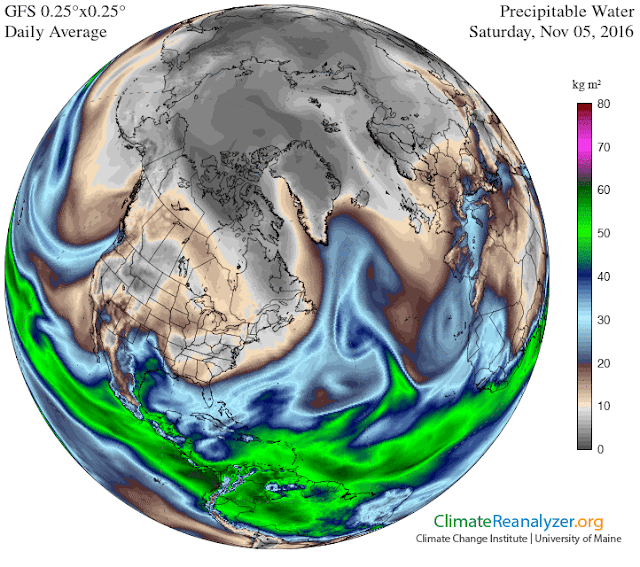 Now winter gets isolated, its basic macro geometry has changed.